I certainly do not profess or claim to have an impressive looking fourteen, or even two degrees and titles in fine art as some artists can cite on their websites. I believe titles belong on the bookshelf and have little use for the practical sculptor or artist. Titles and degrees certainly do look impressive on a web site or resume, but they don’t create artwork: the sculptor’s mind, heart, spirit and hands do! 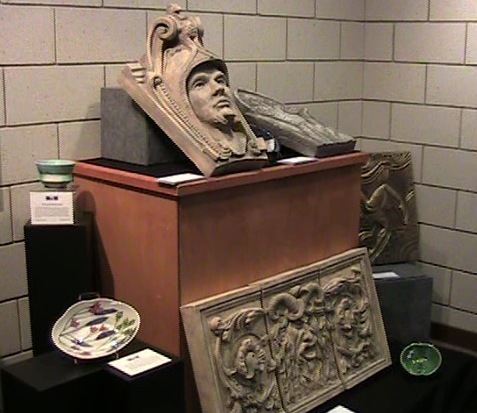 Having been exposed to architectural sculptures in such depth as I was from age thirteen with a large collection of pieces salvaged from demolished buildings gives me a unique insight into this unusual form of Victorian era sculpture: the gargoyles, keystones, frieze panels, columns and cornices. 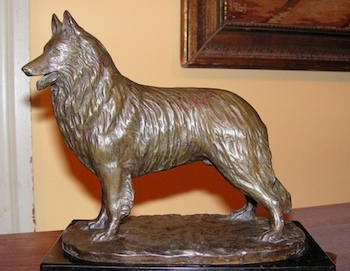 Sculpting my own models in earnest came about after many years of reproducing antique pieces, making molds and casts from them, I would be in my thirties before I modelled dogs in bronze, and in my fourties before modelling architectural pieces and learning along the way. My work was good enough that I was offered a sculpture scholarship at Iowa Central Community College (non credit classes) to continue learning with a focus on the human face, and refining my work. I was invited by the Blanden Memorial Fine Art Museum in Fort Dodge, Iowa to set up a display of my work in the museum where it remained for public viewing for several months. 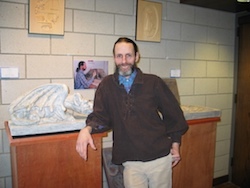 For my clients I want my work to be unique, surprising, stunning, interesting, and full of a connection to history they can relate to, and a connection through time to the anonymous sculptors who created the original works mine are based upon. Back in the second half of the 19th century, times were slower, mail took weeks if not months to reach a recipient, electric lights were a revolutionary world changing new technology much as computers today are. A trip to a city that is but an hour drive away today, took perhaps two days via the standard transportation of the day, the horse and buggy. There was little mass production as we know it today, certainly not on the scale of today’s modern computerized production. Women wore long dresses, the men wore suits, hats, and carried a pocket watch. They carved wood and stone, as well as sculpted clay and cast metals by laborious methods, the cost of doing so today would be prohibitive. The style of the day in everything from clothes to architecture was frills, lace, decorative, elaborate, perhaps even excessive by today’s standards. Even mundane utility articles as well as buildings were made, built, or constructed to last from one generation to the next, and beyond. Most of this tradition is now lost to time, changing “styles” increased costs, and demands for things to be had quickly to name but a few reasons. As a result, we have become a throw-away society where few things are made to last, and buildings are demolished (if they don’t fall apart first) before they have seen thirty years of use. In my teen years of rescuing carvings, metalwork and sculptures from buildings being demolished, even I at the age of thirteen could tell that great care went into the design, making and construction. I could examine a terra cotta sculpture and see the long deceased sculptor’s finger prints and marks still pressed into the clay and not only feel a connection, but start wondering about the life of the artist who created the anonymous work. I often wondered how it was back then with these rough, tough, gun slinging cowboys who got into gun battles at the drop of a hat- going to work at the brick factory, hanging up their hat and gun belt, and then creating these delicate little designs with cherubs, flowers, birds, ribbons and other feminine elements! Either they managed to put work aside from all else, or Hollywood has steriotyped these men completely wrong. Who was he? where did he live? what was his life like in 1890? what were his thoughts during the hours it took to create the work? and so forth. It is easier and we relate more to someone in a photograph who lived in 1890 than someone we read about who lived in the 12th century and almost seems to be little more than a myth or story to us. Before long, I wanted to try creating the same sculptures, replicating the processes and designs, in some small way subconsciously I’m sure, to try to bring back the style. This is certainly not possible on today’s steel and glass boxes, but perhaps in a small measure in people’s homes and gardens as a sort of shrine if you will, to the lost Victorian and the subsequent “Art Deco” periods. While it is unlikely we will ever return to the styles of the Victorian or Art Deco eras, I hope with my architectural sculptures that people will be able to touch, view and walk around them and feel the same awe and connection to the artists of another century whose lives were so totally different from ours today.